Sunday we enjoyed another day of wonderful skiing at Mores Creek Summit. 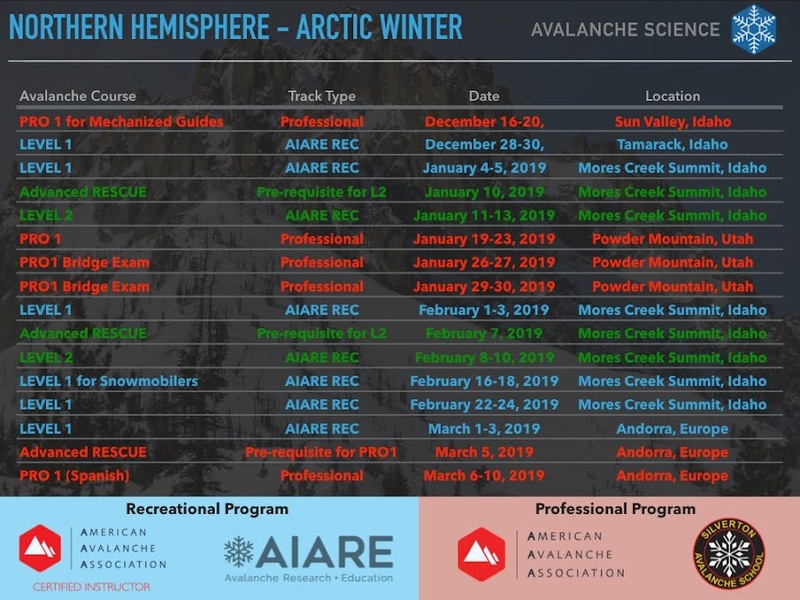 Saturday I was teaching a NSP Avalanche classroom session, and it felt good to be in the outdoors after spending a full day indoors. Similar to last weekend we parked at Mores Creek Summit summit knowing that we will have to walk back at the end of the day. I always prefer to ski to the bottom of Summit Creek or Mores Creek, instead of skiing back to the pass. Soon we should receive another 20-30 cm of snow that will ease setting uphill tracks from the lower switchbacks. Next a picture of the snowcat getting ready to "manicure" the road to Pilot Peak for the snowmobilers. Brad and Bill with Sunset Peak in the background. The day started cloudy, by noon the sky cleared, the wind decreased from moderate to calm, and the temperatures rapidly peaked above 0 degrees Celsius. It is worth noting that there were Coyote footprints suggesting that these animals are using the uphill tracks. VERY SMART indeed. Also I applaud the several "snowshoe" tracks I observed at several place during today ski tour. This incredible area should not be domain only of randonee/tele tourers or snowmobilers. Freeman ridge below with some very nice ski tracks set Saturday! With all the many touring possibilities at Mores Creek Summit area I rarely return to same slopes a week later, but I wanted to dig a snow pit close to the same location I did snow pit work a week ago (at Top of The World). However, this time Brad performed the stability tests. Not surprisingly the layer of "Near Surface Facets" (NSF) were the still present at 45 cm below the snow surface. This slope tested has 30 degrees of steepness, a SEE aspect, at an elevation of 7700 feet. 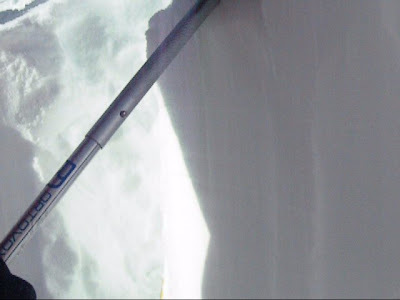 This is NOT a good picture, but the weak layer can be seen halfway in the snow column below the shovel. The NSF layer produced easy ECT (Extended column Test) and easy CT (Compression Test) scores with Q2 quality. Fracture propagation results were negative, but we noticed that the fracture propagation (ECT-N) was arrested after 45-50 cm.A quick check on structural weaknesses (Lemons) revealed the following:Weak Layer in top meter - layer of concern at 45 cm. Weak layer thinner than 10 cm - it was ~ 5 mm thick. So, the five lemons and Easy scores with moderate Q2, clearly suggested prudence, particularly with the warming temperature trend and air temperatures above 0 degrees Celsius. In addition E and South aspect slopes were experiencing numerous "pinwheels" and "rollies" due to the warming trend. Notice the "maximum" temperatures above O degree Celsius from the Mores Creek Summit not only today (December 5th), but during December 2nd and 3rd. In the long term the warm temps might assist in improving the snowpack structure in the 45 cm interface. The bad news is that we had to manage angles today, and the recent pow suffered from the unavoidable densification and formation of a crust surface at East and South aspects. But as long as you kept your skiing to N/NE aspects and above 6500 feet, the skiing was extremely fun in boot high powder. I always request my ski companions to allow me to indulge with the great food that can be found at Idaho City eateries. But most importantly, our visit to Idaho City local restaurants supports the local economy! It is the least we can do, after having so much fun in their backyard and playground! Below you will notice the BIG smiles from the Gold Mine Restaurant host after Brad had his dinner delivered after a full day of skiing at Top of The World, Almost Top of the World, and the Knob Ridge areas. Thanks Dave, Bill, and Brad for a day of camaraderie and friendship!